Sony is developing a followup to the PRS-T2 e-Reader and it is poised to be submitted to the FCC within the next month. The company normally announces new devices in July and releases them in October. The big rumor right now is the deviation from the standard release cycle and getting a new product to market really soon. Sony normally discounts the current generation before it releases the new model. The Sony PRS-T2 e-Reader is being discounted in the UK, with lighted case and AC charger for 139 euros. It is also being sold with a $20 discount at Best Buy and Future Shop in Canada. It is heavily discounted basically at most stores in the US, Canada, and UK. Sony has recently revised its online ebook store and opened up a new book of the month club. It has ditched Google Books as an official partner and is doing great business with Overdrive. Now that Google Reader is being discontinued, the Evernote integration is a really big selling point. 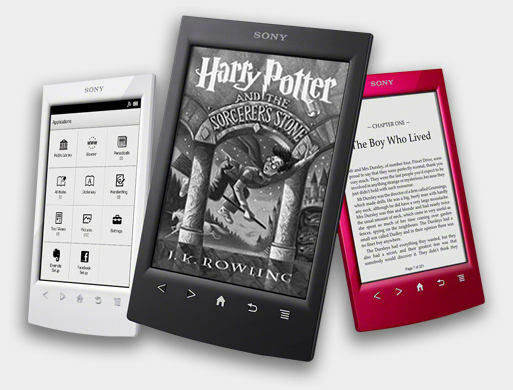 A new generation Sony e-Readers is due to be announced soon and it is rumored to use the same type of frontlight technology that the Kindle Paperwhite and Kobo Glo use. Another 6″ reader? Why does the world need this? Why isn’t anyone making larger sizes screens with frontlight? It’s as if during the last century all printers decided to print only mass-paperbacks, because there were cheap. At least an 8″ or even a 7″ screen would have been a differentiation point and scoop up all the ereader customers who find the 6″ Kindle screen too small. I’ll be interested to see what it’s like. I’ve got a PRS-T1 at the moment – the T2 didn’t offer enough that was new for me to upgrade. And it’s looking like the T3 will only match technology that’s already been out for several months – Sony will have to think up something new if they are not going to be continually playing catch-up. Personally, I like a 6″ screen – it’s small enough to fit in a handbag, and to hold with one hand for reading. A larger screen would definitely be a minus-point for me, because it would just be too big to cart around (or I’d have to buy a new handbag). The new AuraHD from Kobo is 6.8″ apparently, so not everyone is going for 6″. The problem with Amazon is that its ecosystem is great – if you only want to buy from Amazon. Plus, they don’t make a reader with a microSD slot, so I wouldn’t be able to get all my books on it. Hence, for my needs, the Kindle series is out of the question. It’s probably a good thing we all want something different from our ereaders! would LOVE an 8″ display, combine that with a higher res screen and better battery life, and you would have me sold! yes, 8″ or at least 7″ is badly needed. As to 6″ – I think that PRS-T2 is just perfect, the best 6″ reader by far (if rooted). I hope Sony will not make a useless piece of junk like Kindle Paperwhite and T3 actually will be an improvement. T2 is certainly a significant improvement over T1: much better replacement firmware (thanks, Rupor), warmer white color of the screen – very very pleasant and natural, like real paper. T1 – a bit bluish. Easier to press buttons. Beautiful matte body (if black). I am afraid that Sony will succumb to the pressure to add that light distributing layer – if so, Sony, please make also a model without it. And do not switch to capacitive touch screen, and do not remove the hardware buttons. And make it an open android instead of making it difficult to hack. Remember, Sony – your eReaders are worth buying and probably the best in the world only if they are hacked, otherwise – Nook makes rooting easy and safe and is a better choice than PRS-T1/T2/T3 if you cannot run Cool Reader on it. Look up the Kobo Aura HD. It’s 6.8″ with highest definition display of any dedicated e-reader. If you want 8″ or 7″ you’re looking at a tablet not an e-reader. I think that when it comes to a dedicated e-reader people generally don’t want something much bigger (in terms of length and width) than a paperback book. As for Amazon’s ecosystem, the problem with that is that you’re locked into in. I like Kobo because I can load any book I acquire from anywhere onto my reader, instead of having to buy from Amazon. Bring back 7″, make a Z line version (water/dust/shock proof) and include the frontlight. I don’t even care what you charge for it. I’ll pay the premium if I can get that. But for now, my wife and I have left you Sony for your competitors till you can get your act together. This is a market you owned all to yourself. Looks where your past mistakes have gotten you now. Please don’t make me happy for nothing, because that is what I have been waiting for all along. If the new Sony reader features a highres screen, stronger processor and good quality front lighting and a bit more storage space, it would be an instant buy for me. I would like a modernized PRS-950 more than anything else. I would like Sony to ad a faster 1 GHz processor, a high res screen and front lighting and at least 4Gb of internal storage, but preferably 8Gb. They should keep the beautiful and robust aluminum design of the PRS-950. I love it. I also love the internally stored stylus. It is perfect. Also the dictionaries are mandatory. They are the best in the entire ereader business. If they wanted to cut some corners they could remove one of the card slots. One slot is enough. I would not really mind if the audio got removed either. I would pay premium for such a reader.